Sat 4 Oct | A Live Literature Co.
To mark World Poetry Day (21 March), Word N Sound would like to salute the young writers who have gotten us excited about poetry and keep us motivated and inspired to keep pushing when things get tough. Kurt Schröder, Modise Sekgothe, Zewande Bhengu, Roach Du Plessis, Apiwe Mjambane, Elysium Garcia, Bafentse Ntlokoa, Xongani Maluleka, Nkululeko Ngwenya you are amazing and we salute you. Kurt Ludwig Schröder is a Poet/Storyteller based in Pretoria, South Africa. He is currently completing his final year of undergrad studies in Human Movement Sciences at the University of Pretoria. While he studies and works in the field of sport, he has always enjoyed creative writing and drama. Kurt is relatively new to performance poetry. He is a fresh young story-teller who started writing and performing poetry in early 2012. Most of his content is based on personal life-stories and experiences, and he strives to share art that will “re-sensitize” a numb and desensitized world. Kurt co-founded and co-directed a Pretoria-based poetry movement called “Spoken Sessions” which successfully hosted monthly poetry events from June/July 2012 until January 2014. Kurt recently started working closely with Emote Record Company to record and produce his poems and stories. Kurt dreams of one day traveling the world to share his poetry. Modise Sekgothe has been a writer for the past 6 years since 2007 having begun as an abstract Hip-Hop lyricist for the first 3 years. His exploration of Performance Poetry began in the year 2010 as a member of the UJ Poetry Society formally known as “Fore.Word Society”. He has headlined and performed in all their major annual shows as an individual and in collaboration with a number of other prolific poets and performers. Aside from this, he has graced many stages throughout Johannesburg either in the form of slams, poetry competitions or open mike sessions. To mention a few, he performed as a guest performer in the regional semi-finals of the DFL lover And Another semi-finals in 2011. He has also recently performed as a representative of “Fore.Word Society” at the Izimbongi Poetry Festival 2012. Aside from his experience as a Performance Poet, he has also quite recently explored other avenues of theatre through drama. He has thus far been part of three professional theatre productions under the UJ Drama Company. The first of these was “SA Shorts” which premiered at the Grahamstown National Arts Festival in 2012 and was also staged at the University of Johannesburg Theatre. Followed by “The Boy Who Fell From The Roof” which was part of the “ThatSoGay Festival” hosted by the UJ Drama Company also in 2012. Lastly, in the current year of 2013, he was part of “Equus”, the prolific play by Peter Shaffer, also under the UJ Drama Company. Further explorations of both drama and poetry came in the form of a poetical or dramatic poetry independent-theatre production called “The Funeral”. “The Funeral” was conceptualised, directed and co-written by Simo Mpapa Majola including co-writers, Modise Sekgothe, Obakeng Makhutle, Nyameko Nkondlwane and Lakai Saadiq. Zewande Bhengu is a growing, ambitious theatre director who has a strong opinion on the socio-political, the national economical and the general world of arts and recreation. His journey in art began at an elementary level with short poems and further on in high school, he began to perform poetry at school functions. In 2007 he moved to Johannesburg to study Dramatic Arts at the National School of the Arts, during that time he performed in a number of poetry sessions, open mic sessions, expressions night and the like. He directed a number of poetic works at this time and his best work was ‘The Speakers’ that earned him platinum certificates upon its success. He also co-founded Night Vigil Sessions which was hosted at the South Point Building (Norvic House). He was part of the ’21 Poets and Poem’ cast which played at the Jo’burg Theatre Space.Com and the Jo’burg Theatre Fringe Stage. His later successful work was when he co-wrote and directed FIRE:BURN, which was staged in 2013 during Wits University Orientation-Week, The National Arts Festival, 969 Festival and had its last run at the Drama For Life Festival. He has since won the All Res Council Talent Show, The Christian Action Fellowship Talent Show (Twice) and in a display of versatility, took second place at the Transformation Office’ Photographic Competition. He later took the King of the Mic tilte at the Word N Sound Series Season 4 Episode 1. I started writing when I was about 15, with the intention of composing lyrics for a band that hadn’t even existed yet. I went on to play bass in many bands, (and now currently for Brainwreck), while my lyric books piled up. At the age of 24, I went to Brighton in the UK, where I rediscovered my love for poetry in the form of spoken word at a venue called the Sanctuary. At that point, I dusted off my lyric sheets and got back into writing. Since then, I’ve gotten involved with Poetry collectives such as House of Hunger, Gold Peanuts, Liquid Tongue and Word N Sound, often taking part in their slams and open mics. Through Poetry, I try to convey concern for topics that the public are kept blind to. I wouldn’t say I’m entirely political, but I do address issues that matter, while touching on subjects that remind us of our humanity and the importance of individuality. I aim to make my writing extend as far as possible, but I do feel that if I can reach at least one person, and make them think or feel, my objective has been achieved. I am a 22 year old upcoming spoken word poet. I am random, I love music and I enjoy my own company. I am a social misfit to put it mildly. It all started in 2005 when I was completing Grade 9 at the East London Science College in the Eastern Cape. I didn’t know much about urban poetry at the time but I wanted to deliver an assigned oral task in a new, more exciting way. I had just discovered that I could communicate differently. That I could speak poetry. And I kept it a secret until I came to Johannesburg. In 2010, with my move to this concrete jungle, I began attending and performing at open mic poetry sessions. That is when I realised that I was not just entertaining what most people call a ‘hobby’ I was actually practising the ideal way of communicating with different souls. I think that’s one of the reasons I enjoy writing. After studying journalism at the Boston Media House I started building my profile as an Artist. I have grown a lot in my craft. I am currently part of a spoken word organisation called Word N Sound Live Poetry and Music Series a platform which grants me the opportunity to express my love for language and self-expression. Nkululeko Ngwenya, better known as Page is a 20 year old poet from Durban, South Africa. Also a B Sc Marine Biology student at UKZN Westville Campus he only started really performing on 2011 but has already been accepted in the circles and hearts of where he’s been. He describes his poetry as, himself; saying “my poetry draws from characters such as my father and other close family as I do myself”. He has performed at Jomba! , Word N Sound Experience, Give Me Ten Mics, Cup O’ Thought and other nationally prestigious arts festivals. He was one third of the Poetry Africa SlamJam team against the European team from the Ordsprak Festival (Sweden) on the 16th Poetry Africa Festival in 2012 as well as being chosen the next year again to partake as the prelude poet for the 17th Poetry Africa Festival he is nowhere near stopping as he was first to be revealed as one of the headliners at KwaZulu Poetry Festival this April. Slam poetry champion of Cup O’ Thought as well as winning many minor events of the same kind has seasoned Page as a performer to travel around South Africa performing in Pietermaritzburg, Vryheid, Eshowe, Johannesburg and many other places. Writer, poet and performer. Credited for her unmistakable truth telling and unique style of writing. Xongani started writing in high school for the lack of original poetry in her literature syllabus. As there were not many writers at her school to inspire growth in her poetry, she took leave from writing until university when she joined the University of Johannesburg Fore.Word Poetry Society and began to blossom into an eminent performer. She has performed for important stages including the Word N Sound Poetry Slam where she won second place in the August 2013 top five. Her showcase at the Next Generation ‘Let’s Talk Homosexuality’ show remains closest to her heart as it was there that her voice became an ally for the activism of LGBTI rights. Elysium Garcia is a writer and performance poet. An artist from childhood, his writing is a peculiar gallery of imagination and dream scape. Inspired by works of magical realism, absurd fiction and texts of mysticism, he writes his poetry from an alternative perspective, or as he defines it; ‘The Shadows.’ Garcia has been seen on stages in Johannesburg, Durban, Pretoria and the Vaal. In 2009, under a different forgotten name, he was part of a poetry collective formed at the Vaal University of Technology known as Secret Society 1696, blank compact discs were trafficked under seats at poetry shows with some of his’s primitive work of writing. It was not until 2010, that he opened up to a broader audience and came to Johannesburg to join and take part in the ever flourishing creative revolution of performance poetry. Elysium has exhibited his work alongside many renowned names in the South African poetry community and international visitors respectively. He is one-third of Basic Channel, a poetry collective in Johannesburg currently working on numerous multimedia projects and literature products. He is the current Slam For Your Life champion and two times monthly (June and September) Word N Sound open mic poetry league king of the mic. His performance portfolio is comprised of performing at several poetry showcases and events in the country including a performance at TEDx Johannesburg in September 2013, Melville poetry festival (2013), Drama For Life poetry slam (2010), Izimbongi Poetry Festival (2011), Cup-O-Thought (Durban 2012), Current State of Poetry (2011), Likwid Tongue, UJ Poetry Festival (2010), he finished in the top 3 finalists of the first TEWOP Slam in 2012, top 10 finalist of the 2012 Word N Sound open mic league. He features in the 2012 Word N Sound poetry mix tape and KPN Live arts video mix tape. Born Sekang Bafentse Ntlokoa on the 26 of June 1985, this gifted mother of two fell in love with spoken word art after hearing Janet Jackson recite Maya Angelou’s ‘phenomenal woman’ in the movie Poetic Justice when she was only 10 years old. At age 16 she began scripting her own material but nothing she felt was poetry until age 21 when her spoken word artist boyfriend convinced her to take to the stage in 2006 at a poetry event organised by the VUT poetry society called Uvuko. Bafentse did a few more performance in Johannesburg at Crammers coffee shop with balladry composition and some at Wits with but hasn’t always felt confident in her abilities as a spoken artist. It was only recently when she graced the stage with her enchanting piece called ‘beautiful like a gaping wound’ that the poetry public began to stand up and take note of this lyrical gem. Some patrons have been quoted as saying. 1. 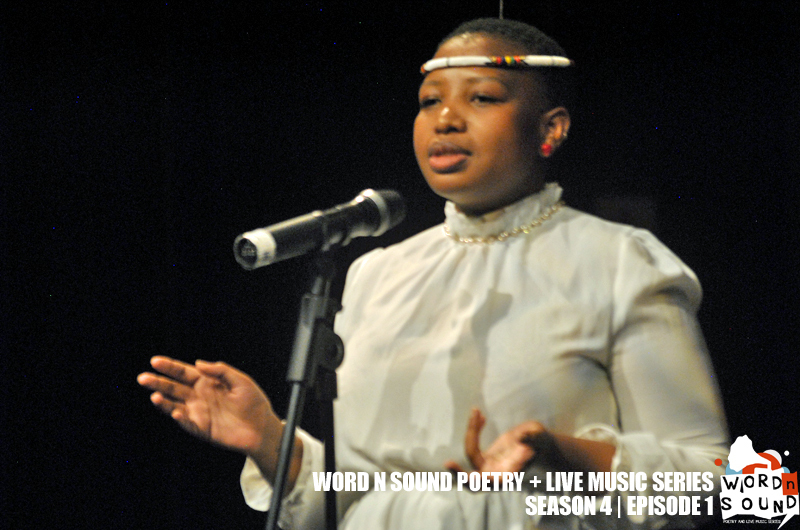 What inspired the poem you performed at the last Word N Sound Series and what message were you trying to convey through it? A few things. Firstly, ‘beautiful like a gaping wound’ is one of my favourite complements to give (and receive though I haven’t ever). It’s not pretty but it’s undressed, it’s vulnerable, it’s messy, it’s inside out and so honest that it can’t help (well to me anyway) but be beautiful. And then it’s my love-hate (mostly love) relationship with romanticism because of how it exaggerates beauty and humans can be so literal in our interpretation that the peeling away of the romance can be very achy but in the same breath it’s also necessary to help us survive ourselves, it’s the orange with the castor oil to clean our insides. And nothing quite beautifies the ugly and unbearable in the way that art does so it’s my ode to that particular art form. It’s also having observed poets transform their deepest pain into the most beautiful art works that inspire life to hold on to itself just a little longer. 2. Take us through your creating process; how the lines come together, the memorizing and performance? I guess I listen for the memory of the feeling of what I’m trying to portray and search my mind for the story and the metaphors of how most exciting (for me) I could tell it. 3. Name 3 of your favourite poets currently? Mutle Mothibe (no bias I swear) he astounds me and keeps getting better all the time. Kagiso Tshepe the imagery that live in dude’s head though and Mandi Poeficient Vundla is an Epic tale for me. 4. Can you take us back to the first time you fell in love with poetry? Can you remember the poem or where this took place? I was 10 years old, watching the movie Poetic Justice and hearing Janet Jackson reciting Maya Angelo’s phenomenal woman and even more than the phenomenal woman described I felt a deeper desire to have been the author who designed her with words. 5. Name 3 of your favourite books?